Though asphalt roofing is popular in U.S. homes, metal is appearing on more and more houses. The latter is naturally fire-resistant, which can provide insurance savings, and reflects heat, which can save energy. Roofers who install this material must be familiar with its standard lengths, so they can order the correct amount. Metal roofs present a clean, contemporary appearance. 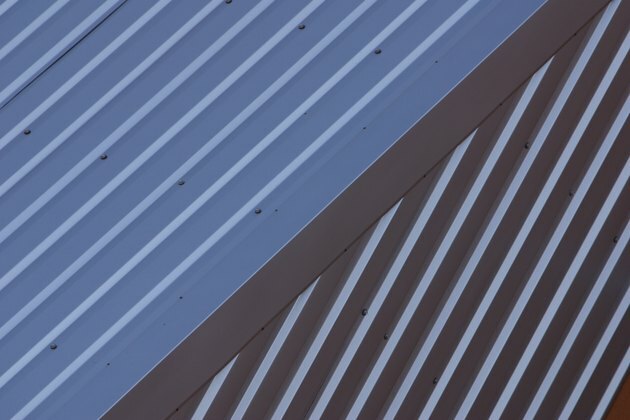 The measurements of metal roofing vary by style, material and manufacturer. For example, corrugated panels are made from galvanized steel and aluminum. They are useful for both walls and roofs because they are tough, lightweight, weather-resistant and impervious to mold and insect damage. Manufacturers offer this material in specific sizes, such as those produced by Corrugated Metal, a Pennsylvania manufacturer. The size of its corrugation ranges from 1.25 to 4 inches. Its panels come in stock sizes of 18, 20, 22 and 24 gauge, with widths of 27 through 46 inches. Its 42-inch panel can run 8, 10 and 12 feet in length, while its 27-inch-wide panel is available in those same lengths but also can be up to 20 feet long. Though precut metal roofing panels can be conveniently ordered and transported, using them can produce waste. You must order enough panels to exceed the surface area you intend to cover or you risk leaving a hole at the top of the house. The amount of waste depends on the panel length, with longer panels potentially covering more area, but also risking the greatest overages. One way to avoid this is to order roofing that is cut to length, so you order only the amount you need. For example, a classic rib panel, which Metal Roofing Wholesalers calls the most popular for residential and farm buildings, comes in 36-inch widths but in lengths you specify. Another example is standing seam panels, which come in 12-inch or 16-inch widths but can also be custom cut to appropriate lengths. Shingles are another type of metal roofing that can offer the look of other materials with none of the disadvantages. For example, because its surface can receive any color and be textured appropriately, a metal shingle can duplicate the look of wood, yet avoid wood's disadvantages, such as rot, moisture penetration and the need for constant maintenance. The size of shingles varies by manufacturer and material, but a typical example measures just over 12.5 inches wide and 39.75 inches long, with 12 inches of exposure. A box of this material can contain 15 shingles (which covers about 49.2 square feet) or 30 shingles (which covers 98.4 square feet). Roofers must consult the International Residential Code before deciding what type and length of metal roofing to order, since this document defines most of the local and state building codes for roofing in the U.S. Panels, for example, can go on roofs with slopes as little as 2 percent, allowing their use in modern architecture. Metal roof shingles, on the other hand, can only be used on roofs with slopes that are 25 percent or greater, making them more suitable for traditional-style homes.